Graham & Rosie Sugdon didn’t really get a comfortable nights sleep on their rock’n’roll bed, so they made some further investigations. This is their story. We have been sleeping OK but not really well in the Bongo, we both agreed that we slept better in the tent on an air bed. So we decided to look at air beds to fit a Bongo. The approximate width in the Bongo is around 1 metre and after much searching we found that you needed to look for a ” Full sized ” single air bed, ( most are 75cm not 100cm). The only one we found was a ” GELERT ” Air bed £16.98 at Amazon. We put this in a “single” Black and Grey Quilt from Asda £8, with a “Double” Quilt in a Black and Grey cover from Asda £10, and with a single memory foam from pound stretchers £10, and with another “single” Black and Grey Quilt cover over the memory foam. We now have a colour coded bed and Quilts and we are warmer and more comfortable. It takes about 30 seconds to inflate. In the Morning we tidy the bed up, deflate the air bed, and we then roll everything together to the rear of the Bongo , pull up the seat back, and the bed is put away! Quick and tidy. Next time we need it , we drop the seats roll out the bed and blow it up. 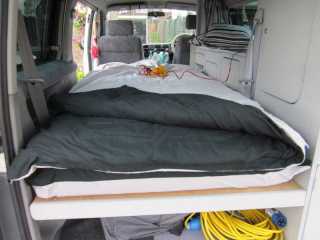 We don’t take the 2 rear foams with us any more so we have more storage spage behind the back seats ,and we put the main foams either in the roof or on the dashboard or in the awning at night ( you could use them for a mattress to sleep in the roof).